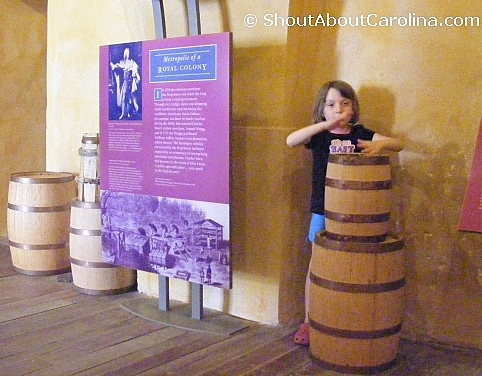 The Powder Magazine is the oldest public building in South Carolina. It took us about 20 minutes to visit the museum. 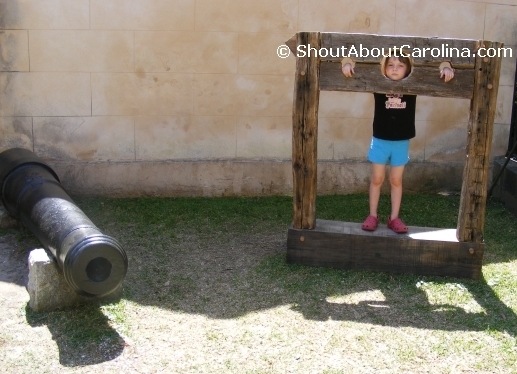 Admission was $2 (free for my daughter) which is about right, for the easy going, brief peak into colonial Charleston history. •	In 1713, under the Lord Proprietors rule, the Powder Magazine was completed in the northwest corner of the Charleston fortifications. • Col. William Rhett – the same guy who will later capture the famous Stede Bonnet, The Gentleman Pirate – was appointed Commissioner of the Fortifications. • The building had thick brick walls and a sand packed roof designed to collapse in an event of explosion. Iron nails and metal fixture were kept to a minimum to prevent inadvertent sparks.Today, you can still see an exposed section of the original brick. 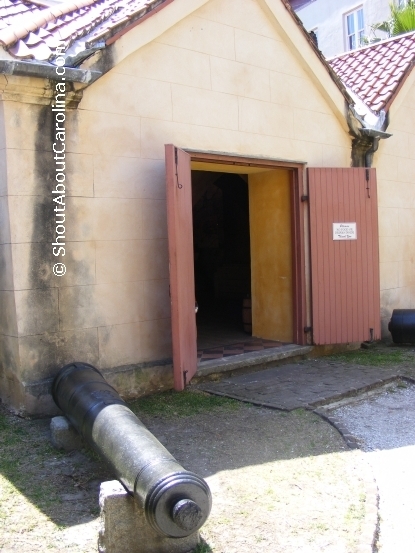 •	From 1713 to 1770, and again briefly during the Revolutionary War, it was used as storage building for loose gunpowder. 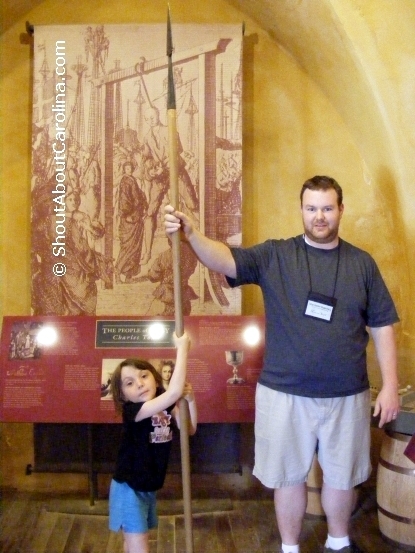 Afterward it became a livery stable, wine cellar, print shop, and finally a museum. 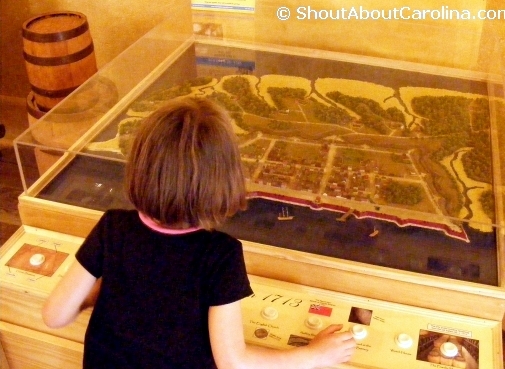 • In 1902, the National Society of the Colonial Dames of America and the State of South Carolina purchased the building and opened it as a museum. •	Recently, the Powder Magazine has been restored to its original appearance (except for the addition of a thin plaster wash inside to protect the brick from a chronic moisture problem). 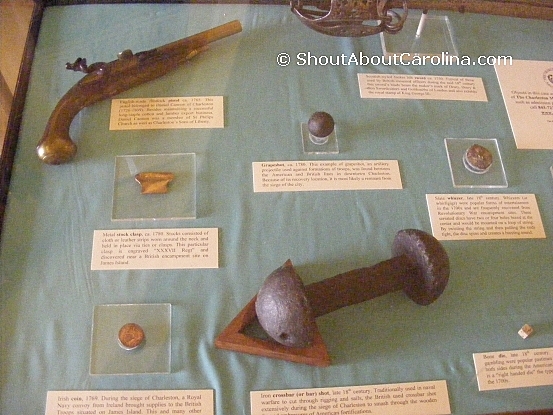 • Two Revolutionary War cannons, found in the Charleston area. The field guns featured the British “GR” – Georgius Rex – stamp, in reference to King George III. • Iron crossbar, Irish coin, English flintlock. The walls and moat that surrounded Charles Towne allowed entrance only by sea at the Cooper River wharves and by land over a drawbridge near the intersection of Broad and Meeting streets. Look mom I am a warrior! •	In 1706, five French and Spanish ships sailed into the harbor to conquer the colony. Colonial forces lead by Gov. Nathaniel Johnson and a fleet of six small ships lead by Col. William Rhett repelled the invaders. •	In 1715 the colony faced its biggest threat, when Yemassee Indians with support from Spain, attacked the English settlements. More than 400 colonists were massacred. Carolinians flocked to Charles Towne, regrouped and marched out to counterattack. By 1716, the Yemassee were defeated and driven into Florida. Then the Proprietors amassed the lands owned by the Indians, angering the settlers who have fought and won the war. • In 1719, surprise, surprise…the colonists “peacefully” overthrew the Lord Proprietors, and South Carolina became a royal colony.